Despite plenty of competition in the market, Web browsers tend to look and act pretty much the same. Raven is a new contender out today for OS X which takes a fresh approach. Raven’s key unique offering is that it offers customised interfaces for a wide range of popular websites. Visiting its built-in Web App Shop allows you to access dedicated ‘apps’ for the likes of Facebook, Twitter, Google+, YouTube, LinkedIn and even The Next Web. 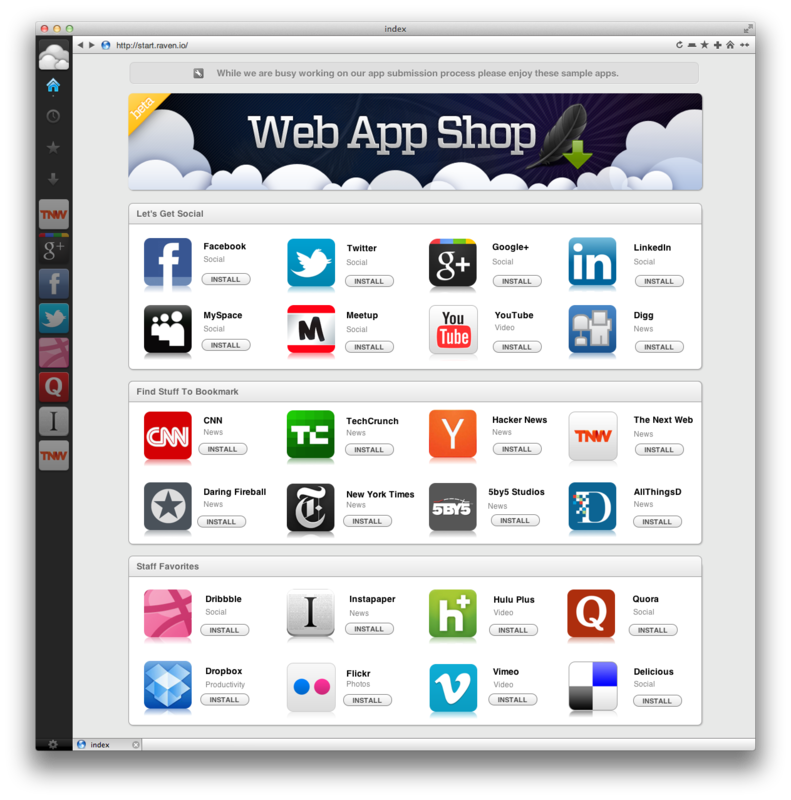 For each app that you install, you get an icon in Raven’s sidebar. Clicking it reveals a list of site-specific commands. So, the Twitter app offers shortcuts to your mentions, DMs and the search function. Facebook’s app has direct links to the newsfeed, your messages, friends and the Events page. 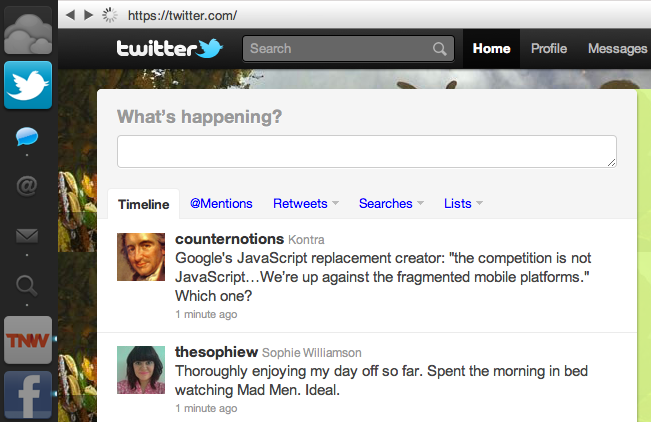 Meanwhile, The Next Web app offers shortcuts to our Twitter, Facebook and YouTube accounts. When the content in any of your apps is updated, you get a subtle but noticeable blue light next to its icon in the browser sidebar. Other innovations offered by Raven include a new take on your browser history, offering a visual preview of each to the right of the traditional text-based list of pages you’ve visited. Meanwhile, clicking the ‘star’ icon on any page takes you to a screen where you can decide whether you want to store it as a traditional bookmark, or as a Favorite. Favorites are intended to be the sites you visit most regularly, and are accessible quickly from the main site interface, while bookmarks are for things you want to keep for long-term reference. 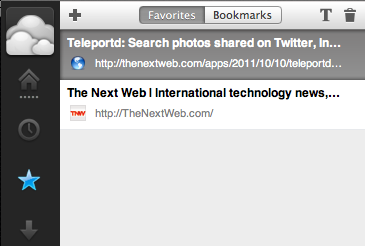 Bookmarks and Favorites can both be saved to Instapaper for easy, text only offline reading. What’s immediately noticeable about Raven is how wilfully ‘Mac-ish’ it is. It’s clearly been designed to look and function great with Apple’s desktop operating system, and even the features it borrows from other browsers, like autocomplete suggestions in the URL bar, are delivered with a real sense of style. Built by a team based in locations as diverse as Paris, California and Vietnam, a lot of care and attention has been paid to the user experience of Raven. However, the question is will you want to switch from your current browser of choice? 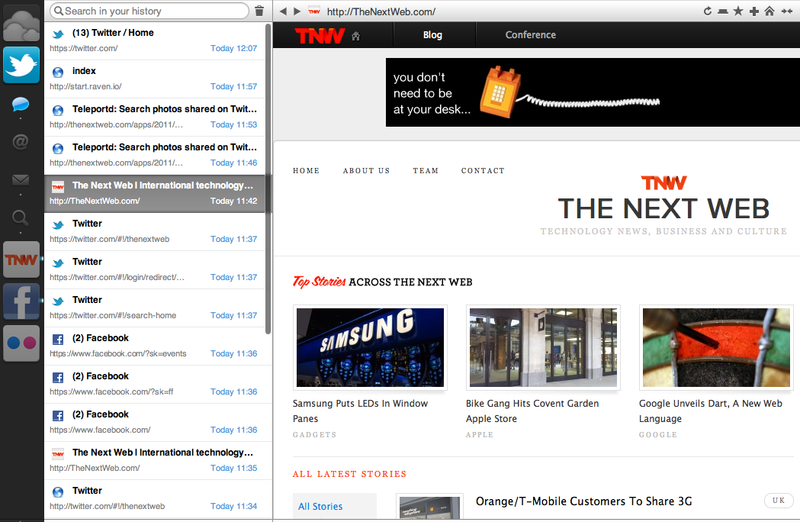 It’s early days, but if you’re a frequent visitor to the sites that Raven offers dedicated sidebar apps for, you could well appreciate the convenience it offers, while its sense of style is unique, feeling completely at home with other Mac-only apps like mail client Sparrow and Twitter’s official OS X app. It’s not as speedy as Chrome or as extendable as Firefox but if its app-based approach takes off (more apps are promised, including the ability to submit your own) we could be looking at another solid contender in the browser wars, at least on the Mac. Raven is a free download from Raven.io. Discover the latest update to excellent Mac email app Sparrow.